Tiburcio Tercero Ramirez was born April 6, 1973 in Coahuila, Mexico. He was the son of Crespin Ramirez and Micaela Tercero. Circa 1900 Tiburcio married Maria de Jesus Oliveres, his first cousin. She was born in 1877 in Ojinaga, Chihuahua, Mexico, the daughter of Jose Oliveres and Canuta Ramirez. (See http://www.lifebeforetheruins.com/marcos-ramirez.html for more information on the Ramirez family.) Tiburcio and his family arrived in the United States in 1908 and by 1909 had settled in the village of La Coyota. Tiburcio earned income by selling fuel wood and timbers to the mines and by farming. In 1917 and 1918 he sold fuel wood and timbers to the Study Butte Mining Company for $126.35. From 1915 until he left the area in 1940 Tiburcio farmed a part of Survey 7, Block 16, along the west side of Alamo Creek. After this land was acquired by Albert Dorgan in the 1930’s, Tiburcio farmed the land for shares of the crops. Maria de Jesus died of cancer February 23, 1937 in Terlingua and was buried there the next day by her husband. For a period of 18 months prior to her death she was attended by Chisos Mining Company physician J.K. Miller. In 1940 the family moved from La Coyota to Study Butte, and in 1946 they moved to Marathon. Tiburcio died September 13, 1948 in Marathon from complications of cancer and is buried in the Marathon Cemetery. 1. 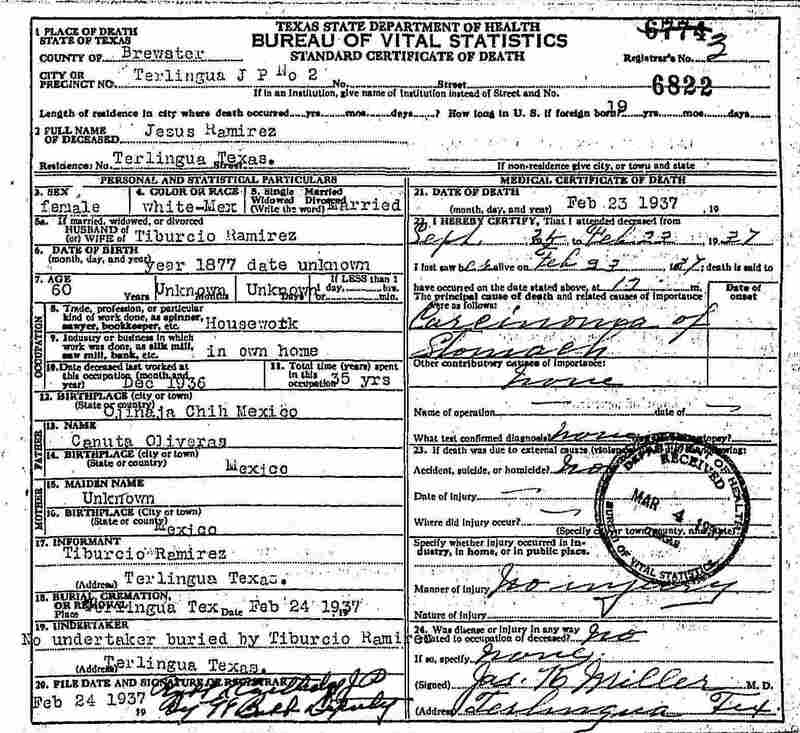 Son Francisco Ramirez was born circa 1902 in San Carlos, Mexico. He came to La Coyota with the family and was still living in the area in 1940. He worked for the La Harmonia Company in Castolon as a farmer and ranch hand, and also helped operate the engine that powered the irrigation pumps. On August 22, 1926 he married Petronila Silvas. She was born May 31, 1905 in Castolon to Leandro Silvas and Maria De Anda. Theirs was a double wedding with Petronila’s sister Merced and Tiburcio Garcia at the Steele Ranch (now known as the James Sublett farm) about four miles west of Castolon. For more information on the Silvas family, see http://www.lifebeforetheruins.com/leandro-silvas.html. Francisco and Petronila made their home in Castolon. Petronila died in Castolon October 28, 1939 from acute septicemia resulting from an infected abrasion on her lip. She is buried in La Coyota Cemetery, but her grave is not marked. After her death the children were raised by their grandparents, Tiburcio and Maria de Jesus Ramirez in La Coyota. (1) Son Mack Oren Waters, Jr. was born in Alpine October 30, 1949. (2) Son Jack Waters was born in Alpine July 18, 1951. (3) Daughter Rosa Elma Waters was born in Alpine July 26, 1953. (4) Daughter Sylvia Ann Waters was born in Alpine June 22, 1957. B. Son Cornelio Ramirez was born in Castolon September 16, 1930. In 1940 he was living with his grandfather Tiburcio Ramirez in La Coyota. He attended school in Castolon and remembers riding a donkey to school. He moved with the family to Study Butte and later to Marathon. In 1948 he went to work for Big Bend National Park. He married Mariana Aguilar and in March 2005 they were living in Alpine. C. Son Domingo “Shorty” Ramirez was born in Castolon October 22, 1932. In 1940 he was living with his grandfather Tiburcio Ramirez in La Coyota. For many years he worked for Ken Barnes, a local surveyor. In October 2005 he was living in Study Butte. He died August 22, 2011. D. Daughter Eliodora “Dora” Ramirez was born in Castolon July 4, 1936. In 1940 she was living with his grandfather Tiburcio Ramirez in La Coyota. In March 2005 she was living in Alpine. E. Daughter Refugia “Cuca” Ramirez was born in Castolon July 4, 1939. In 1940 she was living with his grandfather Tiburcio Ramirez in La Coyota. In March 2005 she was living in North Carolina. 2. Daughter Andrea Ramirez was born circa 1907 in Mexico. She married Manuel Carranza in Brewster County July 22, 1933. In September 1948 she was living in Marathon. 3. Son Andres Ramirez was born circa 1908 in Mexico. In 1940 he was living with his father in La Coyota and was working as a farmer. A. Daughter Micaela Ramirez was born June 20, 1934 in Terlingua. B. Son Raul Ramirez was born March 3, 1938 in Brewster County. C. Son Manuel Ramirez was stillborn in Castolon May 23, 1940. He was buried by his father in Castolon. D. Son Ciriano Ramirez was born September 25, 1944 in Brewster County. 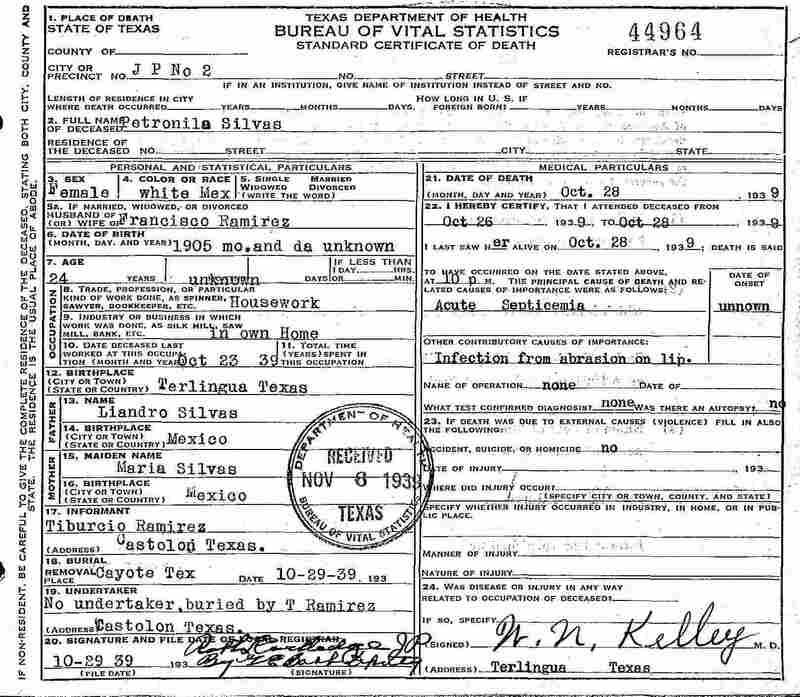 E. Daughter Eva Ramirez was born October 28, 1945 in Brewster County. 5. 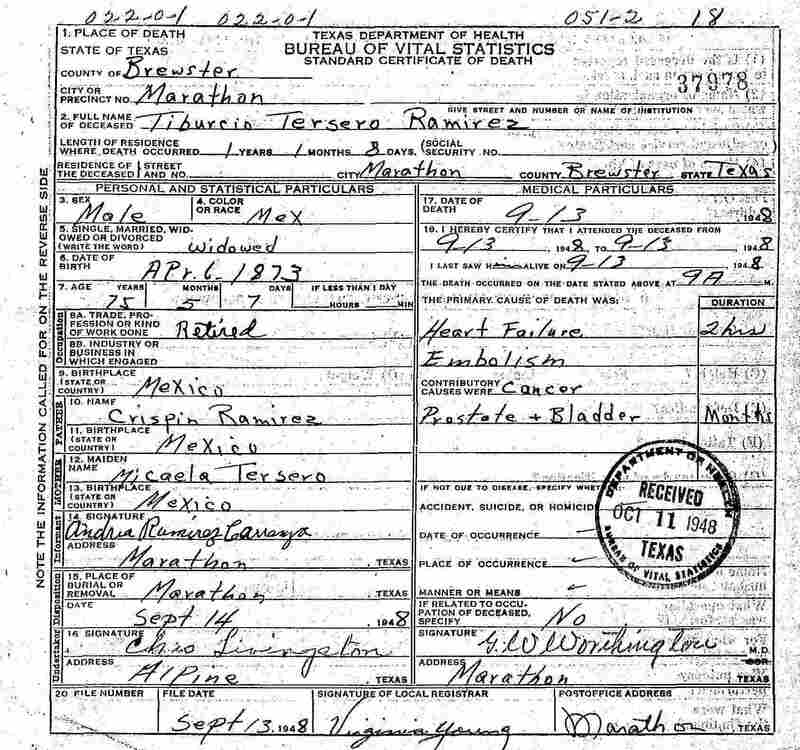 Daughter Celestina Ramirez was born in Terlingua March 6, 1911. In 1940 she was living with her father in La Coyota. 1910, 1920, 1930 and 1940 Federal Census records for Brewster County. General ledgers and other records of the La Harmonia Company, Castolon, held by the Archives of the Big Bend, Sul Ross State University, Alpine, Texas. Big Bend National Park Oral History Program, interview with Cornelio Ramirez. Indexed (brief) versions of birth, death, marriage and divorce records, accessed via Family Search.org, a service provided by The Church of Jesus Christ of Latter-day Saints.